"This is a very old-fashioned version of cornmeal pancakes which rise overnight. It came to our family via my great grandmother and dates back to the mid 1870s. The cornmeal gives these pancakes a tiny hint of fried mush, a splendid treat that exceeds my patience to make." In a large bowl, stir together the cornmeal and boiling water. Let soak for about 15 minutes. While still warm but not hot, stir in the flour, sugar, milk and yeast. Cover, and let rise overnight in the refrigerator. In the morning, mix in the eggs, baking powder and salt. If the batter seems too thin, add more cornmeal to thicken it up. 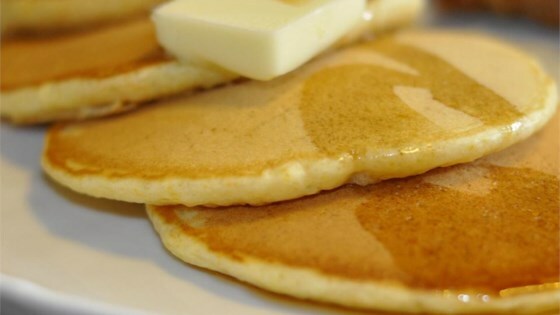 If desired, set aside a cupful of batter for the next morning's batch of griddle cakes (see Cook's Note). Heat a lightly oiled griddle over medium heat. Spoon pancakes onto the hot griddle, and cook until browned on each side. Serve at once with butter and syrup. To use the reserved cup of batter for the next morning, mix the same way--just eliminate the yeast and use the starter (batter) instead. Intriguing taste and texture. Needed more cornmeal and I liked to top the finished cakes with lots of butter. I followed the recipe perfectly and they turned out great. Very Good!